It is easy to change font size in cells of Explorer Views, but this function is still in the development stage! Please read also this: ► ... Possibility to make OWN theme in Q-Dir for Windows? ... No Expand Triangle and Lines in Explorer Tree-View! Info: use of other fonts i will make the font usage better! (Image-2) Change font size of Explorer List-View! It is not necessary to change the size of all elements. You can only resize the text for a specific element without affecting the size of the entire system, which involves changing the size of all elements of the interface. 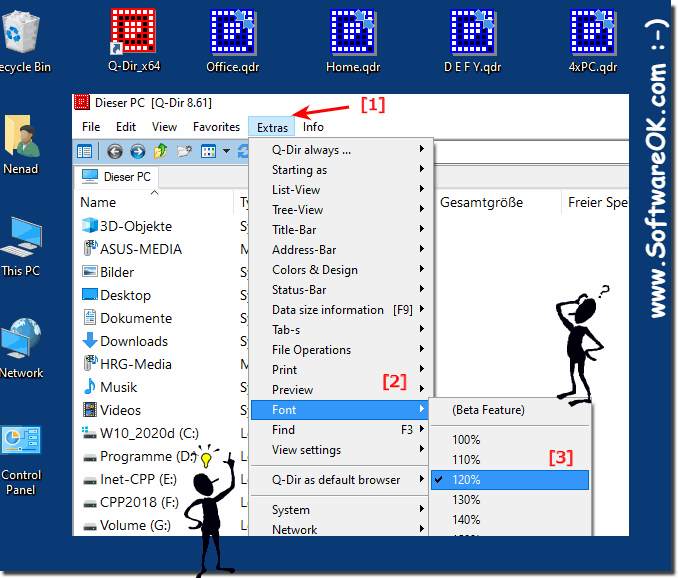 Q-DIR - FAQ-107: How to change font name and size in cells of Explorer View!